Hello Friends! I hope your weekend has been wonderful so far. I have a card to share with you today, featuring a stamp set from a new stamp company called, Altenew. This stamp company is the creation of two VERY talented ladies, Tasnim Ahmed and Jennifer Rzasa. I have had the pleasure of having them for teachers in the Watercolor for Cardmakers Online Class. Both ladies are fabulous with watercolors and if you haven't visited their blogs, I encourage you to hop on over. My card was inspired by this beauty HERE, created by Jennifer McGuire. The inspiration photo from the Altenew September challenge inspired my color palette. I stamped the images from Altenew's Persian Motifs set with Versamark ink onto the smooth side of a piece of Tim Holtz Distress Watercolor card stock and then embossed them with White Pearl embossing powder. Then, I watercolored the images using Peerless Watercolors...LOVE, LOVE, LOVE those watercolors. I used the same technique that Jennifer McGuire showed in her video, linked above. It's really very easy to do and the results are always different and always nice. You really can't go wrong with watercoloring an embossed image. It's a super fun technique and I hope you'll give it a try. Next, I stamped the sentiment. Then I used a piece of patterned paper to mat the focal panel. And finally, I adhered the focal panel onto my card base with foam tape and added a few pearls to finish it off. Beautiful! The watercolored flowers are perfect. I just can not master watercolor. I should have invested in the Peerless instead of a cheap set. Barb, your card is gorgeous. 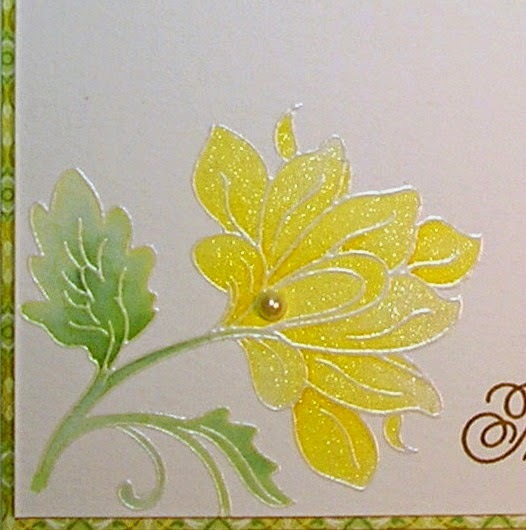 The watercolor embossing technique makes those beautiful flowers so life like. The WOS and pearls are perfect finishing touches. This is absolutely gorgeous Barb. So soft and pretty. 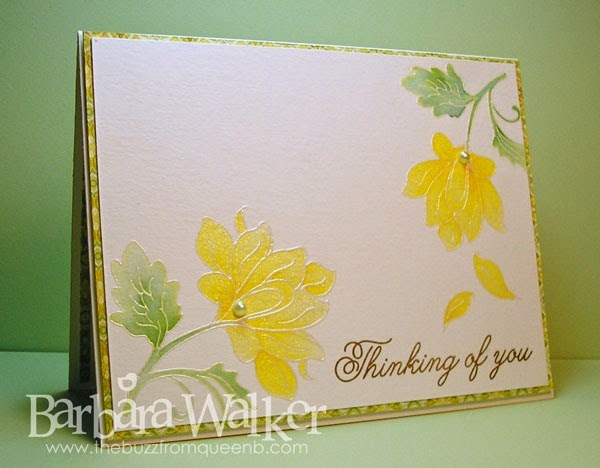 A gorgeous card Barbara, fabulous water colouring of the beautiful embossed flowers!! 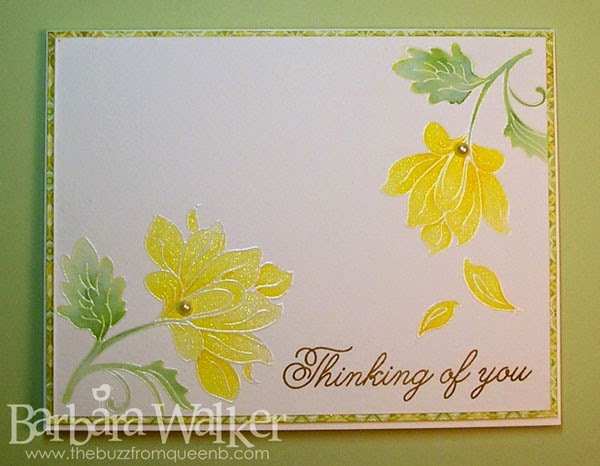 Your card is so pretty Barb! I too love the Peerless water colors :) Thanks so much for playing along!